Barack Obama has a tendency to show up at some of my favorite out-of-town foodie spots — about a month after I've eaten there. The first time was about a year and a half ago, on his first big date with Michelle after taking office. (Ringing any bells? Maybe I'm only remembering this because they dined at Blue Hill, where Vance took me on a weekend away for our first anniversary.) There's something about the President crossing paths with a restaurant Vance has taken me to that makes me smile a bit, like I have the best husband ever. This past week the President landed at a different favorite, on the opposite end of the country: The Grand Central Bakery. Which just happens to be one of my must-visit food spots when we're in Portland (yes, I know, he went to the Seattle location). They make some of the best bread, cakes, pastries, and cookies I've ever had, all with a focus on local, seasonal ingredients. Hello!! Jamie!! I'm like a giant glazed cake doughnut! You know you want to eat me. 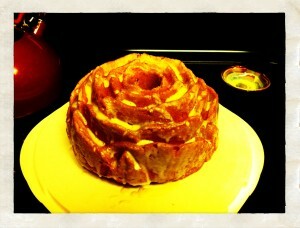 So here's yet another post in the Portland memories series: a vanilla cake that is even lovelier with one of those pretty rose bundt pans. It's rich and incredibly moist on the inside, with a bit of sweet crunch all the way around from the glaze. And don't even think about skipping the glaze — it's the simplest thing to make and takes this vanilla cake to the next level. Serve this one with some fresh seasonal berries; if you have some raspberry dessert sauce or lemon curd laying around, this would be a perfect time to highlight that as well. I don't have a stand mixer, but if you do, definitely use it! I have a strong partner in the kitchen who was willing to mix up the batter for the full length of time, so if you have one of those, you can use him instead! ;) Whatever you do, don't skimp on the time whipping up the batter or your finished cake won't have that perfect texture. Combine the dry ingredients. Measure the flour, baking powder, salt, and nutmeg into a bowl and sift or whisk to combine. Cream the butter and sugar. Using a stand mixer with the paddle attachment (Jamie note: or your strong right arm), beat the butter and sugar on medium-high speed until the mixture is very light in color — almost white — and the texture is fluffy. Scrape the bottom and sides of the bowl a few times during the process. Add the egg whites and vanilla. Combine the egg whites and vanilla in a liquid measuring cup. With the mixer on medium speed, add the egg whites slowly (about ¼ cup at a time), completely incorporating each before adding the next. Scrape the bowl several times. Alternate additions of the dry and wet ingredients. Reduce the mixer speed to low. Add one-third of the dry ingredients to the mixer and incorporate on low speed, then increase the speed to medium. Add 1 cup of the milk and mix briefly to incorporate. Reduce the speed to low again, add half of the remaining dry ingredients, and mix to incorporate, then increase the seed to medium and beat for 1 minute. Repeat with the remaining 1 cup milk and the remaining dry ingredients, but stop mixing just before the flour is fully incorporated. Finish mixing by hand, using a sturdy spatula and being sure to scrape up from the bottom of the bowl. Bake. Pour the batter into the prepared pan. Bake for 45 minutes, then rotate the pan, lower the oven temperature to 325°F, and bake for 30 minutes more. (Jamie note: If you used a smaller bundt pan and an extra round cake pan for the remaining batter, knock 10 minutes off the first bake time at the higher temperature, and pull the small "extra" cake out 10 minutes early from the second bake time). It's ready when the sides pull away from the pan slightly and it springs back when pressed lightly in the center. The top will probably split; use a cake tester to check doneness. Make the glaze. Make the glaze while the cake is in the oven. Measure the confectioner's sugar, cream, and vanilla into a small bowl and whisk until smooth. Glaze the cake. Let the cake cool for 15 minutes before turning it out. Whisk the glaze again until completely smooth, then use it immediately. Saturate the cake completely, using a pastry brush to coat the entire surface. Apply the entire amount of glaze; it will be enough for several coats.